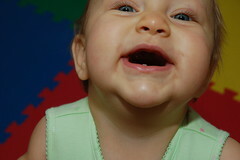 Anne Marie now has two teeth... or at least the makings of two teeth. One (visible) is farther along than the other, which is just barely poking through. Won't be long now, and, as Andy says, she's just won't be a baby anymore with a mouthful of teeth! Our little girl is growing up!